Just like a gracious Southern Belle this luxury home in town will host your family's vacation in grand style. It even has the perfect covered porch with rockers to sit back, relax, and watch the world go by. After all, you are on vacation! Located in the historical district and only a short walk to all of the dining and shopping in Crested Butte, this home has a definite WOW factor! Step onto the fantastic covered porch and you may not want to leave. 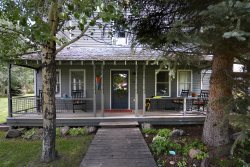 This is a great spot to read a book in one of the rocking chairs or just watch the kids play in the landscaped yard amongst mature aspens and evergreens. Enter the home and kick off your shoes in the spacious mudroom with powder bath. There's plenty of room for hiking boots, tennis shoes, flip flops, ski boots, or just a good ole pair of comfy cowboy boots. Past the mudroom is the relaxing living room with sectional and luxurious chairs to watch the big game or relax in front of the gas fireplace. On the other side of the stairs is the heart of the home and while we have more fine dining establishments than you can count in Crested Butte, you may never want to leave this kitchen. It's a chef's dream with commercial stainless appliances, marble countertops, and gadgets galore. There's even a great espresso machine for that morning pick me up. The kitchen has bar height seating and the adjacent bar area has room for 4 more at table height. Open the doors off the kitchen and breakfast area to the outdoor decks, great yard, and gas grill. The bar area has a wine fridge and commercial beer cooler to keep your beverages within easy reach. Past the bar is the cavernous laundry room and office area should you have to do either chore while you are here. Head upstairs to the second floor where the master suite resides. There is a sumptuous King bed and master bath with soaking tub and steam shower. There is access to the oversized hot tub on this level out the hall door or through a private door in the master. Across the hall is a guest bedroom with King bed and en-suite bath with shower. The third floor is the kid's area with vaulted ceilings, three twin beds, and TV just for DVD's and games. The kids have their own bath with dual vanities and oversized soaking tub/shower combo. Walk to everything or just lay in the yard and count the stars. Southern Belle will host your families vacation like no other! The house was great, close to town and would stay again. For our family of 6 including 2 grandkids ages 8 & 3, this was an excellent choice. Close to town, parks, bike paths, etc. Nice place and with a few minor tweaks would be even better. Very easy for our family with close proximity to Elk Av, biking trails, town parks, busses, etc. Everything worked well. We would rent this place again.